"Shake the hands of all the little kids, YEAAHHH." 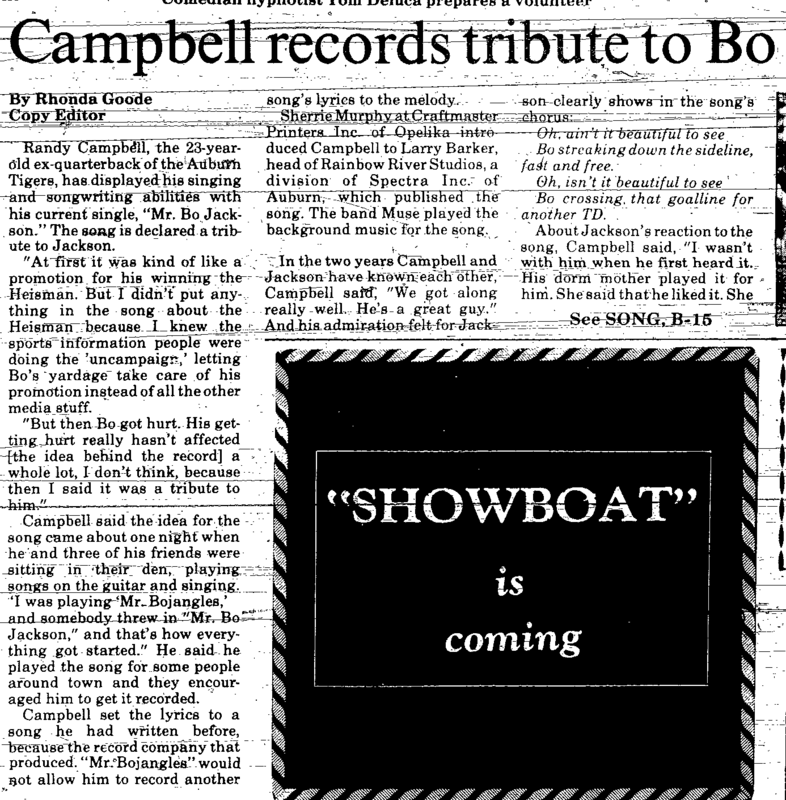 What with the recent flood of Cam Newton for Heisman songs (here, here, here, and here), I thought the series of posts I had planned to absorb the runoff from my story on Bo Jackson for Auburn Magazine should start with a segment from my interview with former Auburn quarterback Randy Campbell. 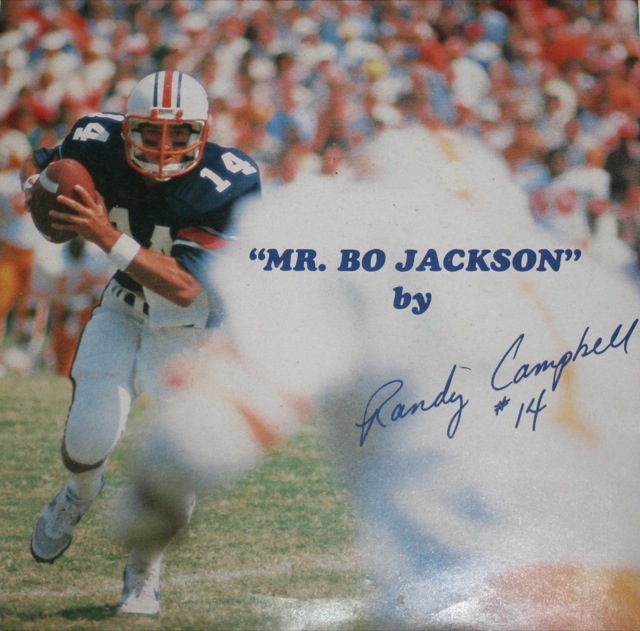 In 1984, at the start of Bo’s injury-plagued junior season, Randy wrote and recorded “Mr. Bo Jackson,” a tribute intended in part to serve as an unofficial anthem to Bo’s (first) unofficial Heisman campaign. Dad spotted Randy as he walked back to his car after the Arkansas State game and I was able to run him down. Once I mentioned the Heisman-winning password, he put down the mace and gave me his phone number. I called him a month ago and we talked about the song and we talked about the man the song is about. But for now I’m just going into the song (and thanking him for sending not just the CD he put out several years back that includes “Mr. Bo Jackson” as a bonus track, but one of the original 45’s). So tell me about this record. Well, it was really kind of fluke how it happened. I had moved out of Sewell Hall when I was still in school. I graduated in December of ’84. So I was on campus his junior year, that fall, finishing my degree. And there were a lot of guys that came around the house and some of them lived in the same house with me that played guitar, so we were sitting around one night, playing guitar and singing songs and somebody played “Mr. Bo Jangles” by Jerry Jeff Walker and so I just got a pad and piece of paper and I started changing all the lyrics and making a parody of that song. I don’t remember if it was that night or later that week, but somebody said you know, we need to record this, or you need to record this, and I actually called Jerry Jeff Walker’s agent to ask permission to do a parody of the song, and they refused. So I just wrote all new music to it and it turned out better anyway, much more of an up tempo fun song then how it would have been. And most of those guys in the band Muse that still plays around Auburn played on the record. I know George Konstant played on it, and Jimbo the bass player played on it. From the October 11, 1984 edition of The Plainsman - click to enlarge (forgot to scan B-15, sorry). What kind of reaction did it get? It was pretty good. The plan was to sell it around the stadium and maybe in the stadium when Bo came back from or during that season, for the home games. And I think about a week after I’d gotten the record pressed, and I had all the vinyls, all the little 45 vinyls back at my house, Oval Jaynes, who was the I guess the assistant athletic director at the time called me over to the office and told me I couldn’t sell the records on campus, because I was using a current player to promote a product for a profit. So what I ended up doing was going around to different sporting goods stores and radio stations and all over Alabama really and I would do an interview on the radio station and they’d play the record, and I might go to the sporting good store later that afternoon and sign autographs and things, and people would come and buy the record. I sold almost 3,000 little 45s. So it was fun. It was just something fun to do. But I think Bo really liked it because a TV station in Columbus, Georgia actually put some of his highlights, you know, in a film, to the record. And they invited me over and I did a spot on the television show, and while I was there, they played the song with the highlight film. And I recorded it and took it back and showed it to Bo, and I think he got a kick out of it so he brought a few of his friends around so they could see it.